Policy analysts around the world point to the Scandinavian countries as exemplars for promoting social mobility across generations without diminishing productivity (e.g. Sachs 2006, Bailey 2016). The Scandinavian model is often contrasted favourably with the US model. For example, an article in the Washington Post (2014) writes that, “[t]he American Dream is now spoken with a Scandinavian accent”. Focusing on Denmark – a prototypical Scandinavian welfare state – we investigate the accuracy of these claims (Landersø and Heckman 2016). We find that social mobility in both countries would be advanced by combining Scandinavian-level investments in early childhood with US incentives to acquire education. Intergenerational social mobility is measured in two distinct ways. When these measures are applied to compare mobility in Denmark with mobility in the US, the comparison depends strongly on the measure used. By one measure, Denmark is far more mobile than the US. By another measure, the two societies are equally mobile. 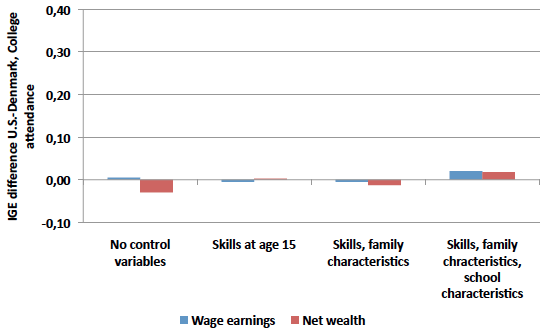 The first measure relates the incomes of children as adults to the incomes of their parents, both measured at the same stage of the life cycle (e.g. Solon 1992, 2004). 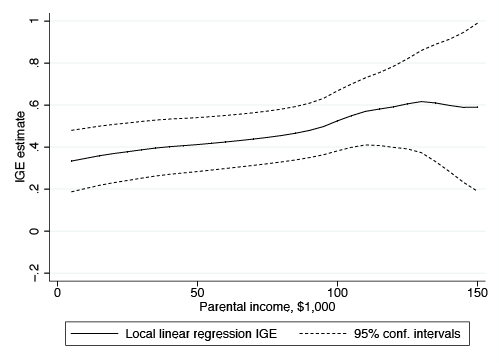 Intergenerational income elasticity (IGE) is a commonly used summary statistic to characterise income mobility. It is the average percentage change in the adult incomes of children with respect to a one percentage point increase in their family incomes as children. The second measure relates the educational attainment of children to the incomes, educational attainment, or general socioeconomic status of their parents. This too is measured by an elasticity relating children’s education to parental social or economic status. This elasticity is the average percentage change in the educational attainments of children with respect to a 1% change in family income or wealth. The lower the value of either elasticity, the less effect family has on the child’s success as an adult for the associated outcome, and the greater the mobility for the outcome being examined. Understanding the sources of the differences in the cross-country comparisons based on the two measures is essential for understanding what policy lessons about social mobility Americans should draw from Scandinavia, and what lessons Scandinavians should draw from the US. Differences in the measures of income used greatly affect estimates of income mobility across generations in Demark and the US. Danish tax and transfer policies are more progressive than those in the US. The heavily unionised Danish economy reduces wage differentials across skill levels compared to the wage differentials by skill in the labour market in the US. Using pre-tax and pre-transfer income from all sources (including capital income and labour income), income social mobility in Denmark is about the same as in the US (compare columns 1 and 2 of Table 1). Accounting for redistribution by the welfare state, Denmark has much greater income social mobility (compare columns 3 and 4 of Table 1). Notes: Standard errors in parentheses below the IGE. Considering pre-tax income from wages, income social mobility is far greater in Denmark than the US (compare columns 5 and 6 of Table 1). This is due to the much more compressed Danish wage distribution by skill levels. Including income from public transfers along with wage income, Danish income mobility increases while the corresponding measure decreases in the US (compare columns 7 and 8 of Table 1). In both countries, mobility is disproportionately lower for children from more affluent families (see Figures 1a and 1b for Denmark and the US, respectively). 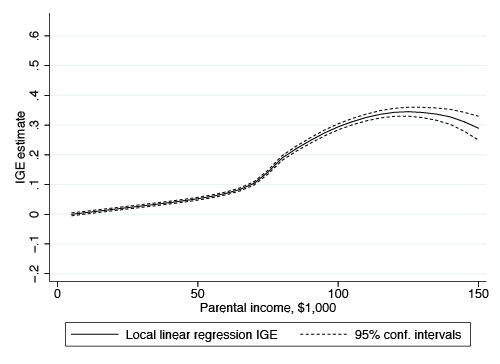 More income-advantaged families in both countries are more likely to pass on their income advantage to their children. 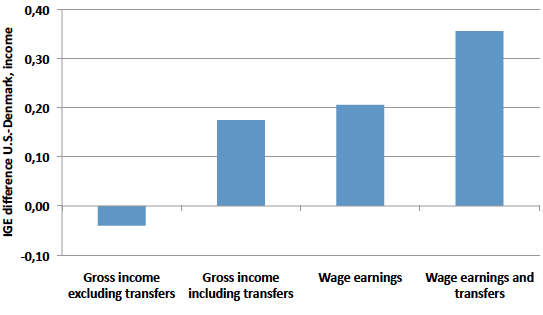 Income mobility is higher (elasticities are lower) in Denmark than the US at all levels of wage and transfer income.1 The story is somewhat different when we use pre-tax and transfer wage income. By that measure of income, the elasticities with respect to parental income are virtually the same in the two countries, but mobility decreases for the less affluent. Popular discussions of the benefits of the Scandinavian welfare state often point to its generous support of childcare and education compared to the US as important contributors to its greater social mobility (Sanders 2013, Partanen 2016). In Denmark, college tuition is free, there is ready access to childcare, pregnancy leave is generous, and there is virtually universal free pre-school. The more child-generous Danish welfare state produces a much more favourable distribution of cognitive skills for disadvantaged Danish children compared to their counterparts in the US.2 A superficial glance at the evidence might suggest that the greater access to skills and schooling explains the greater Danish social mobility across generations. Yet, despite stark policy differences, the influence of family background on educational attainment is similar in the two countries. Table 2 shows the influence of family income and family wealth on college attendance in both countries.3 The relationships between family income and college attendance are the same in both countries. While in Denmark, wealth has a stronger relationship with educational outcomes than in the US. Note: The coefficients are the effects of a 1% change in the indicated variable on the probability of attending college. Scandinavia invests heavily in child development and boosts the test scores of its disadvantaged children compared to their counterparts in the US. It then undoes these beneficial effects by providing weak labour market incentives for its children to attend school. Stated differently, the greater incentives to acquire education in the US labour market tend to offset its less favourable investments in the cognitive skills of its disadvantaged children. Family influence on educational attainment is remarkably similar in both countries. In both countries, at higher levels of family income, the effects of a one percentage point increase in family resources on college attendance are smaller than at medium and lower levels of family income. Figure 2a displays the US educational mobility elasticity controlling relative to the corresponding Danish elasticity for different measures of family background. They are all near zero, suggesting little difference in educational mobility-family background relationships across the two countries. Figure 2b (derived from Table 1) displays the differences in the income mobility elasticities between the US and Denmark for different measures of income. The differences are dramatic for most measures of income. The low Danish economic returns to education, especially for those at the lower levels of education, help to explain the disconnect between the egalitarian childhood policies in Denmark and the roughly equal levels of educational mobility in Denmark and the US. While the Danish welfare state mitigates some childhood inequalities, the sorting of families into neighbourhoods and schools by levels of parental advantage contributes to Danish educational immobility. The more advantaged Danish children attend schools with peers with more favourable test scores. In Denmark, substantial skill gaps remain across children with different family backgrounds (Bleses et al. 2016). Our analysis sends a cautionary note to the many enthusiasts endorsing the Scandinavian welfare state. The Danish educational system boosts the cognitive test scores of disadvantaged children compared to their US counterparts. But test scores are not the whole story, or even the main story, of the adult success of children, despite the emphasis on them in popular and policy discussions.4 Moreover, substantial gaps in test scores remain across social groups within Denmark despite its egalitarian policies. The US excels in incentivising educational attainment. The Danish welfare state promotes cognitive skills for its disadvantaged children. Policies that combine the best features of each system would appear to have the greatest benefit for promoting intergenerational mobility in terms of both income and educational attainment. Baily, M N (2016) “What Sanders gets right and wrong about Denmark”, Inside Sources, March. Bleses, D, P Jensen, H Nielsen, K Sehsted and N Madsen Sjö (2016) “Børns tidlige udvikling og læring [Early childhood development in Danish daycares]”, for Ministry of Children, Education and Gender equality. Borghans, L, B H H Golsteyn, J J Heckman and J E Humphries (2016) “What do grade and achievement tests measure?” Submitted to Proceedings of the National Academy of Sciences. Landersø, R and J J Heckman (2016) “The Scandinavian Fantasy: The sources of intergenerational mobility in Denmark and the U.S”, forthcoming, Scandinavian Journal of Economics. Partanen, A (2016) “What Americans don’t get about Nordic countries”, The Atlantic, March. Sachs, J D (2006) “Welfare states, beyond ideology”, Scientific American, 295(5): 42-42. Sanders, B (2013) “What can we learn from Denmark?”, The Huffington Post, May. Solon, G (1992) “Intergenerational income mobility in the United States”, The American Economic Review, 393-408. Solon, G (2004) “A model of intergenerational mobility variation over time and place”, Generational income mobility in North America and Europe, 38-47.